Available at the bottom of this. 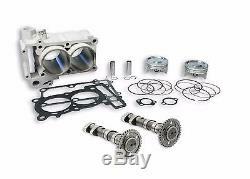 Kit dual cylinder aluminum piston + camshaft. Double cylinder malossi + double power cam. For yamaha t-max 500 from 2004 to 2007. High engine displacement 560 cm3 - piston diameter 70mm. Machining by machine tools c. / thermal exchange surfaces recalculated and enlarged. 2 piston pin ø 15. References malossi: 3113687 & 5913783. Malossi is pleased to present the "super t-max\Compression Ratio: 1:12. Maximum power at 7800 rpm. Monolithic cylinder split into special aluminum-silicon-copper alloy, enhanced and stabilized. Cermetal shirt (ni-ca-sil) worked with extreme precision on cnc last generation. Forged pistons ø 70, 15 axis with 3 segments, made of special aluminum alloy (copper-silicon), enhanced, profiled sky with valve impressions, racing design, strengthened and lightened to constant thickness. 1 ° chromed steel compression. 2 ° phosphated steel scraper. 3 ° broken down into chromed steel with spring. Increased power by more than 15%. Fully projected and produced in our calderara di reno establishments. Follow-up of each phase of realization, from the project to the production, by the malossi technicians like all the products which carry the mark malossi. The two-cylinder monobloc dry and clean design created by yamaha has been customized by malossi in depth by developments that have allowed an increase in the bore without compromising the mechanical and thermal balance of the origin. Very special was the realization of pistons, forged in a special alloy and studied to withstand the stress of long-distance use. Nothing was left to chance, joints to the bi-conical steel pin super attached and the elastic segment of chromed and nitrided steel. Each element is a precious contribution to make this thermal group truly exclusive: a product for a refined and competent clientele! Other thousands of pieces with misterbike. The processing time of your order can vary 4 to 15 working days, contact us before the purchase !! anti-theft devices, batteries, spark plugs, chain kits, pinions, crowns, chains, clutch discs, air filters,, oil filters, fuel filters, oils, engine gaskets, spinnaker seals, brake levers and clutch grips, handles, jaws brake, fixed and floating brake discs, brake pads, motorcycle tires, cross and enduro tires, scooter tires, quad tires, inner tubes, lamps and spotlights, wheel bearings and steering bearings, spraychain, turn signals, mirrors, fork tubes, cables, tank caps, handlebars, saddles, bolts, handlebars, valves and stoppers, contactors, workshop saddles, footrests, belts, exhausts, tools, top cases and windshields. Helmets, rain gear, clothing and anti-cold accessories, tire cover, etc. 03.25.55.74.71 Monday to Friday from 9h-12h to 14h-18h. 06.62.69.50.19. The item "kit cylinder 560 + cam malossi yamaha t-max 500 tmax 2004-2007" is on sale since Sunday, April 9, 2017. It is in the category "auto, motorcycle parts, accessories \ motorcycle parts \ other" The seller is "misterbike-fr" and is located in / at bettancourt la ferée. This item can be shipped to the following country: europe.